Flag signs are one of the most versatile ways to advertise your business. In our fast-paced world, you need signs that are effective enough to compete with the everyday distractions of potential customers. With SignEdge, you can get flag signs that not only attractive and eye-catching, they are effective and greatly help with brand awareness. We produce flag signs in the shape, size, and design that’s most effective for your brand and in the price that fits your budget. Does your business want a sign that catches attention even from a distance? 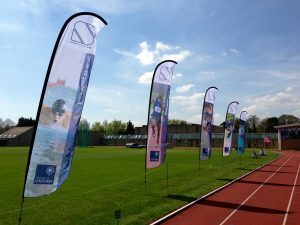 Our feather flag banners are designed to ensure that your establishment won’t go unnoticed. Do you want a sign that’s quick and easy? Our teardrop banners are compact, easy to set up, and very flexible. SignEdge doesn’t just do signs, we are also very proud of our design and printing services. With our strong team of graphic artists, we can help give your business a visual representation of its vision, and then bring that to life through large format digital printing on fabric and vinyl. Flag signs are popular for being lightweight, portable, and easy to assemble. These are exactly why they are ideal promotional and advertising materials for trade shows, kiosks, festivals, concerts, and other outdoor events. You can worry less about signage and just focus on your event. SignEdge offers flag signs that can be set up without tools, without machinery, and without taking a lot of your time. They also come with pole kits made of lightweight but durable materials such as fiberglass, so packing, transporting, assembling, and disassembling them are hassle-free. 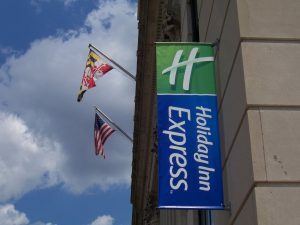 As a full-service sign company, we specialize in providing your business with the exact flag sign that it needs. 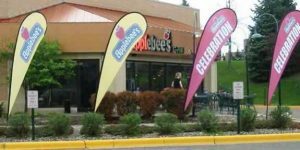 If you are looking for signs that will fit the small spaces in your establishments, SignEdge has swooper flags that take up very little space but still give your brand the exposure that it needs. 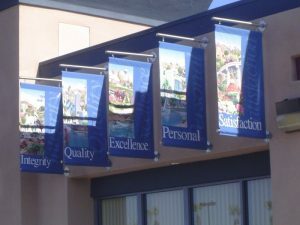 If you need an attention-catching sign fronting your building, we create large blade and banner flags that are perfect for outdoor advertising and promotions. These allow drivers, passersby, and pedestrians to see your brand and know what you offer. If you want a reliable promotional sign for your business, flag signs can be a great option. They don’t cost as much as other signs but the design is highly customizable and can get your brand a lot of exposure anyway. Because flag signs don’t require drilling, mounting, frames, lighting, and such procedures that other sign types do, they don’t require you to shell out as much money. They also take less time and labor to set up and upgrade. At SignEdge and with the price that we set for flag signs, you can order as many as you need and in the sizes and shapes that you need them. Interested in getting flag signs for your business? SignEdge is here to answer any question that you may have about them. We also make sure that the steps you take in getting a flag sign will lead you to effective and sales-generating advertising. With our team of graphic designers, engineers, and signage specialists, you can guide you through every step of the way. Call SignEdge today at (705) 999-5332 for your Free Consultation with a Flag Signs Expert!